Dear Sir/Madam, It gives us immense pleasure in sharing the information that in commemoration of Arutchelvar Dr. N. Mahalingam’s 95th Birth Anniversary, NIA Educational Institution is organizing Arutchelvar Vidya Sakthi Scholarship Award Function 2018, on 26th of March 2018 at Nachimuthu Gounder Centenary Centre, NPTC-MCET campus. This event attracts greater importance this time as it falls on the Diamond Jubilee year of NIA campus. We take this opportunity to cordially invite you to grace the occasion. In order to encourage the studious students and to support their education, the above scholarship scheme was introduced in the year 2016 with the resolution to perpetuate the plan every year. This scheme will benefit atleast 400 deserving students annually. 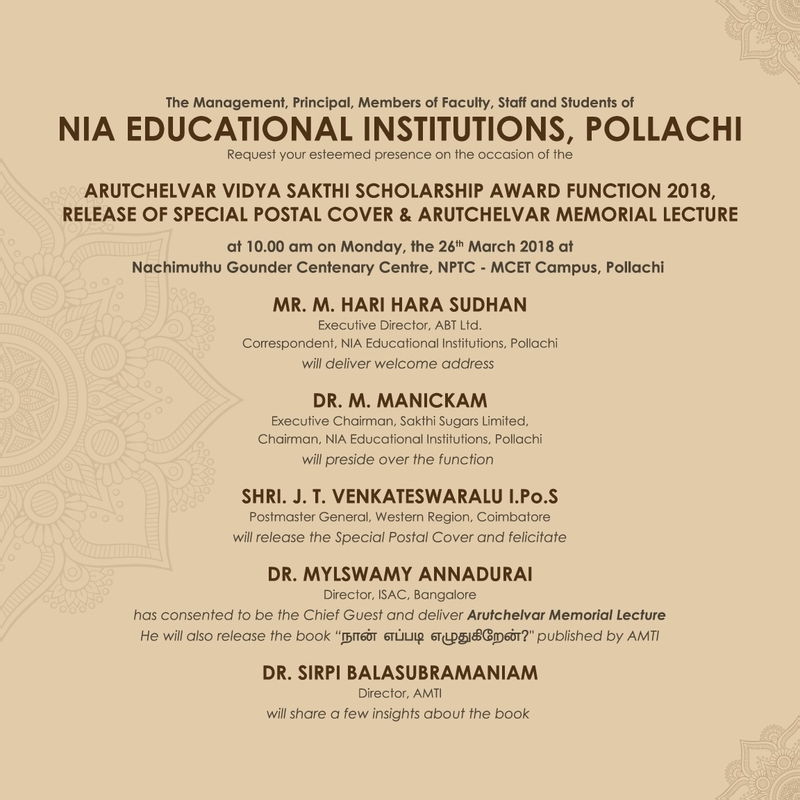 This year in remembrance of Arutchelvar’s untiring efforts to uplift the society and empower the youth through technical higher education, NIA Educational Institution is launching Arutchelvar Memorial Lecture that will illustrate the exemplary life and achievements of Arutchelvar, which will be delivered by an eminent personality. Furthermore in course of the event, honouring Arutchelvar’s philanthropic services Indian Postal Department is releasing special postal cover and stamp of Arutchelvar. We have attached the invitation along with this mail and look forward to your presence and wishes.